Mass Carib is a choral performance piece written by Felix Cross. In 2007 it was performed outdoors at the Royal Naval College in Greenwich by Nitro Theatre Company, as a finale to the Greenwich and Docklands International Festival. To accompany the performance, the festival collaborated with the National Maritime Museum and Nitro on a programme of workshops in schools in Greenwich exploring the themes of the production. Mass Carib was written as a Requiem using the liturgical form of the Catholic Mass. It draws on music from West Africa, eighteenth-century Europe and various Caribbean islands. 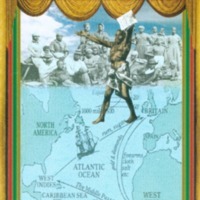 Mass Carib is sung in English, French, Patois, Latin and Yoruba. Bridgetower - A Fable of 1807 is a jazz opera composed by jazz pianist Julian Joseph, with libretto by author Mike Phillips. 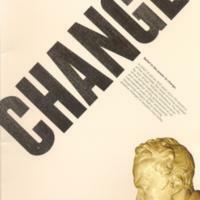 It was commissioned for the City of London Festival's bicentennial commemoration of the Abolition Act. 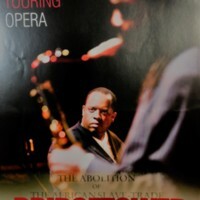 The opera recreates the story of the Afro-European violinist George Polgreen Bridgetower (1778-1860), who was born into slavery, became a friend of Beethoven and was acclaimed throughout Europe for the standard of his playing. The opera was directed by Helen Eastman and toured by English Touring Opera. It opened during the 2007 City of London Festival at London Symphony Orchestra St Luke's, and later toured venues around the UK. Each performance featured a local community choir, with members drawn from local amateur choirs. After 1825, on leaving Parliament, William Wilberforce retired to Hendon Park in Mill Hill, North London, and during his retirement built a chapel on his estate, now St. Paul's Church. St. Paul's organised a programme of events in 2007 to mark the bicentenary, including concerts by The London Community Gospel Choir and The St. Ignatius Gospel Choir. A series of exhibitions in London Borough of Barnet libraries explored Wilberforce's local connections, and visits to local schools encouraged pupils to express their understanding of slavery and abolition in art, and stressed the need to continue the work of abolitionists today. The programme also included a number of open public meetings with invited speakers exploring different aspects of Wilberforce's life and work, including his collaborations with Thomas Clarkson and John Newton. In 2008 the Wilberforce Centre was opened in the crypt space of St. Paul's. 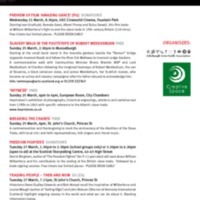 Westminster Abbey organised a series of lectures and events to commemorate the bicentenary. These included the lectures 'Olaudah Equiano, Black Abolitionist' by Professor Vincent Carretta, and 'The Abbey and the Abolition of the Slave Trade' by The Reverend Nicholas Sagovsky, Canon of Westminster. There was also an opportunity for visitors to attend William Wilberforce's memorial. On 27 March 2007 a national service of commemoration was held at the Abbey, and broadcast live on BBC One and BBC Radio Four. The service was attended by HM The Queen, the Prime Minister Tony Blair, other dignitaries and members of community and human rights organisations. Proceedings were disrupted by Toyin Agbetu of the Pan African, human rights based organisation Ligali. He objected to the celebratory tone of the service and its primary focus on William Wilberforce, highlighting the role of African freedom fighters and the absence of an official apology by the monarchy, government and church for Britain's leading role in transatlantic slavery, or Maafa (the Kiswahili term meaning ‘Disaster’, which is used to refer to the exploitation of Africa and its people by Europeans). A collaborative project to explore the links between Southampton and the slave trade led by Southampton City Council, the University of Southampton and The Confederation of African Caribbean Communities. 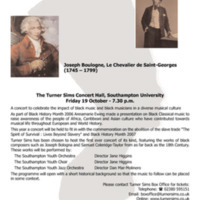 One highlight of the programme was a concert at the Turner Sims Concert Hall at the University of Southampton to celebrate the impact of black music and black musicians. The concert, part of Black History Month 2007, featured the works of black composers such as Joseph Bologna and Samuel Coleridge-Taylor, performed by the Southampton Youth Orchestra, Southampton Youth Choir and the Southampton Youth Jazz Orchestra. 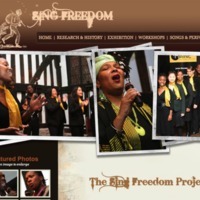 The Sing Freedom project was based on the Spirituals sung by African peoples as a response to being enslaved. The generally Christian songs often contained instructions about escape and resistance. The project was a collaboration between Kainé Management Group, Leicester African Caribbean Arts Forum, Leicester City Council Arts & Museum Service and Library Service. It included research into the songs, a touring exhibition, and performances. 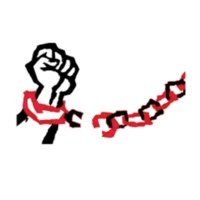 A series of song writing workshops for young people in partnership with BBC Radio Leicester aimed to give each participant an understanding of the effects of slavery and perceptions they have on present day freedom. At Leicester Guildhall Kainé Gospel Choir and friends came together for an evening celebrating the Spirituals, where songs such as The Gospel Train, Wade in the Water and Swing Low Sweet Chariot were sung. A commemorative event to mark the bicentenary in Rothley, Leicestershire, was organised by a planning group of Rothley Parish Church and the Committee of the Rothley History Society. 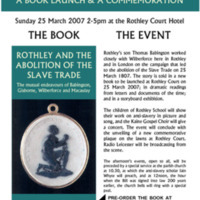 The event on 25 March 2007 launched a new book by Terry Sheppard and Iain Whyte, ‘Rothley and the Abolition of the Slave Trade’, which explored the ‘mutual endeavours’ of Thomas Babington, Thomas Gisborne, William Wilberforce and Zachary Macaulay. These men were linked though family and university connections, and their involvement in the campaign to abolish the slave trade. Many of their meetings took place at Babington’s home, Rothley Temple, now known as the Rothley Court Hotel, where the event in 2007 was held. 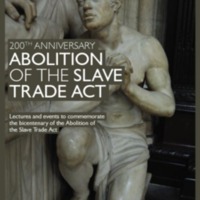 The day included dramatic readings from 18th century documents relating to the campaign for abolition, an exhibition of panels from Anti-Slavery International, an interview with a descendant of Thomas Babington, and a choir concert from the Kainé Gospel Choir. In collaboration with Charnwood Borough Council, a new plaque was unveiled to remember the suffering of African people and the part played in ending the trade by Babington, Wilberforce and others. In December 2007, the planning group invited organisations in Rothley and Leicester to submit items contemporary to 2007 to be placed in a time capsule, to be laid up at the court until the tricentenary in 2107. The oak casket sits behind glass in a niche at the hotel. Hull's parish church of Holy Trinity is where William Wilberforce was baptised in 1759. The Church held a number of performances and events throughout 2007. 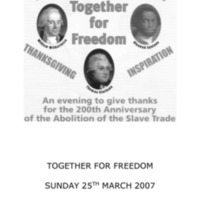 The Together for Freedom commemorative service took place on 25 March 2007, led by the Archbishop of York and featuring the Redemption Gospel Choir from Hull and Middlesbrough. The Freedom Flower Festival took place in June and the Songs of Freedom Music Festival in September, featuring performances by leading gospel performers and local schoolchildren. The London Community Gospel Choir gave a powerful concert, which highlighted the important role of music in the lives of slaves living on plantations. In August, the Freetown Society of Hull hosted a performance of the Milton Margai School for the Blind Choir from Freetown, Sierra Leone. 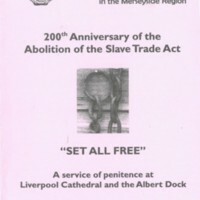 A Panos photographic exhibition at the Church, Slave Britain, revealed the realities of contemporary human trafficking. 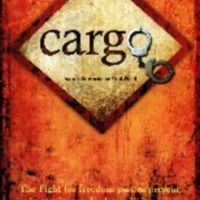 Written by composer Paul Field, Cargo premiered in Hull City Hall in March 2007, sponsored by Hull City Council. 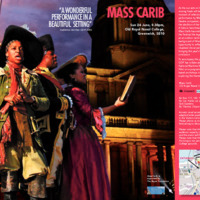 Cargo featured contemporary songs, narration, dance and images that told the story of the struggles of slaves, the historical work of William Wilberforce and the abolition movement, through to the contemporary struggles against slavery today. Performers included the singer Coco Mbassi, saxophone player Mike Haughton and Springs Dance Company. The narrators and choir were local people, including members of City of Hull Youth Choir, Redemption Gospel Choir and Hot Gospel in Hull. Cargo was also performed in London, Plymouth, Bristol and Liverpool. 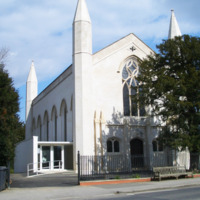 Smaller events were put on by church and community groups around the UK, assisted by the script, score and backing track of the music being made available on CD-Rom. 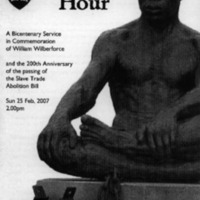 Kirklees Council ran a range of events in 2007, focused on local connections with slavery and abolition. Kirklees Civic Sunday was the official commemoration at Huddersfield Parish Church, with a performance by a local gospel choir and a presentation by actors as historical characters. The links between Yorkshire and the Caribbean were also explored: 8,500 people of African-Caribbean descent live in the borough of Kirklees. Events such as the Jamaica National Independence Cultural Festival, Deighton Carnival and Huddersfield Carnival celebrated African and Caribbean culture. Part of the Kirklees programme was to host the Equiano Project's touring exhibition at the Hudawi Centre in Huddersfield. The Centre went on to name one of its rooms after Equiano. Other events included talks from historians, including Richard Reddie and Paul Crooke, church services, choir concerts and theatre productions. 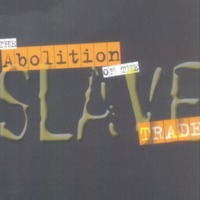 The Slave Trade Abolition in Cambridgeshire & Suffolk (STACS) project was managed by St John's College at Cambridge University (the former college of the abolitionists Thomas Clarkson and William Wilberforce). Working with local schools, the project aimed to raise awareness of the often overlooked roles played by Thomas Clarkson and Olaudah Equiano within the slave trade abolition movement in East Anglia. Drama workshops led by two historical enactors led to student performances of their plays about the abolition movement. Two public presentations run by students, one in Cambridge and another at the Ipswich Caribbean Association, discussed and debated why the counties of Cambridgeshire and Suffolk should remember the life and work of Equiano and Clarkson. The final outcome of the project was the publication of new teaching resources and curriculum material to introduce students to the work of Equiano and Clarkson, and to place the transatlantic slave trade in local, national and international historical contexts. During the course of the project, BBC Radio 4 broadcast a Sunday worship service from St John's College, in association with 'Set All Free'. 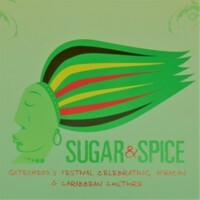 Sugar & Spice was Gateshead's festival celebrating African and Caribbean culture. Held in October 2007, highlights of the programme included 'Mama Africa', South African singer Miriam Makeba; the opera 'Mary Seacole'; a massed performance of 'On Liberation Street' featuring local performers and singers alongside the Grand Union Orchestra; and 'Roll Jordan Roll' featuring jazz trumpeter Abram Wilson performing with the London Community Gospel Choir. The festival weekend also featured street theatre; jazz,blues and gospel music; a light show; and children's arts activities. The Reconciliation Reredos project to develop a major public artwork was the response by Saint Stephen’s Church in Bristol city centre to a complex historical legacy. St Stephen's was the harbour church which benefitted from merchant’s donations, which effectively ‘blessed’ slave trade ships leaving the port, and which served as the burial site for Africans living in Bristol in the era of the transatlantic slave trade. 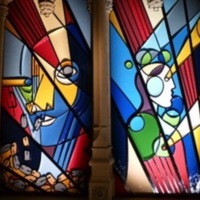 The project involved the commissioning of a new altarpiece: four pieces of contemporary artwork exploring the mercantile connections that built the city of Bristol were created by artist Graeme Mortimer Evelyn, transforming the stone-carved Victorian Reredos housed in the church since 1875. A community learning programme engaged groups of people from the city through workshops, forums and events around the four focus concepts: Creation, Imago Dei (the Image of God in humanity), Reconciliation and Hope.